B & R Glass and Mirror @ 6 Federal Street in Newburyport for generously donating time and materials to fix the screens and windows at our new unit! It takes contributions large and small to help "raise all ships" in the community - thank you Helen and sons at B & R for your help! Hungry? 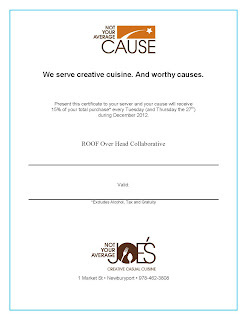 Help ROOF by dining at Not Your Average Joe's on Tuesdays! Rock Center with Brian Williams did a story last week (Wednesday 28 November) on working homeless families - families who have done everything "right" but through medical issues, the rising costs for necessities, or other crisis that have altered earning power or family income, find themselves without a roof over head. The families profiled showed the difficulties for the children. Please watch - these are the families ROOF tries to help locally and with your help, is able to help keep together and keep kids in their schools. So many wonderful things going on at ROOF! While we are still recuperating from the massively entertaining PortBury Follies, the donations keep rolling in! We are so grateful to our sponsors and participants. Our Co-chairs summed it up well in The Daily News! If you missed the PortBury Follies, you can see a recap thanks to the Institution for Savings and Newburyport Today! The PortBury Follies was the red-carpet event for numerous local celebrities showing off hidden talents and also the premier of ROOF's new film. ROOF Co Chairs, Susanne Cameron and Kerri Perry are the guest speakers at Wednesday's Chamber Breakfast - come learn more! And finally, for now, The Yoga Center of Newburyport is supporting ROOF as its October Cause - learn more about ROOF at the Yoga Center's lobby display and attend their class on Sunday 28 October at 2pm --- all proceeds from the class will be donated to ROOF! Visit again soon - so much more in store! Enjoy the recap - and be sure to join us next year! 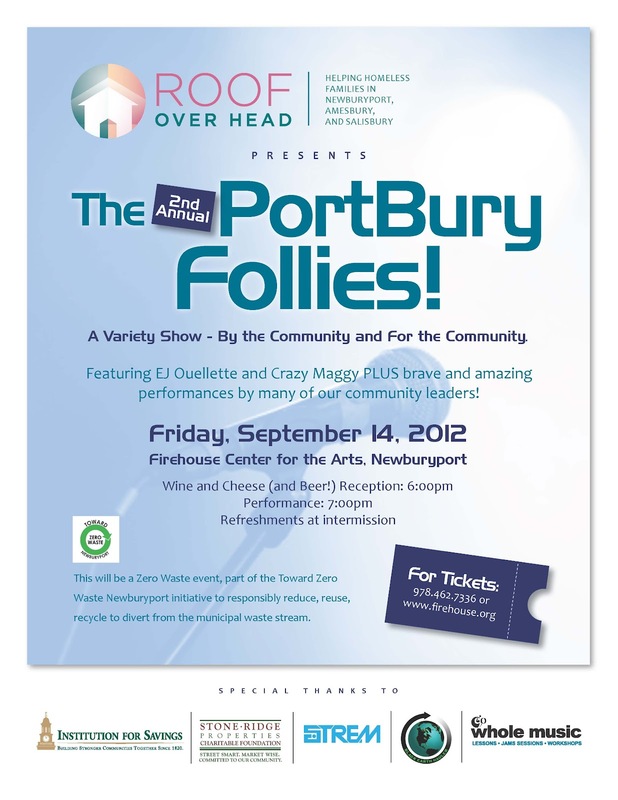 The 2nd Annual PortBury Follies! 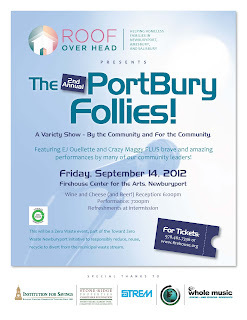 ROOF's 2012 PortBury Follies recap! ROOF's 2012 PortBury Follies was a sold-out show, thoroughly enjoyed by all who were there! You will NOT want to miss next year - just to give you a taste, take a look at this video, produced by Newburyport Today and sponsored by the Institution for Savings. ROOF Over Head Collaborative is proud to announce our new film to introduce our organization and our mission. Please let us know what you think about the film and about ROOF. Our thanks to the Institution for Savings for underwriting this project! ROOF Partners with Next Step Living - Your Free Home Energy Assessment nets $10 for ROOF! Roof Over Head Collaborative (ROOF) has partnered with Next Step Living, a residential energy efficiency company, to help families cut high utility bills by accessing NO COST National Grid energy assessments. For every no cost energy assessment completed through this partnership, Next Step Living will contribute $10 to ROOF to help in their efforts to support local families and children. The Energy Assessment is available to renters and apartments too! Thousands of MA families saved up to 30% on their energy bills last year. Now you can too! Next Step Living contributes $10 to ROOF for every home energy assessment completed through this partnership - Click here to register to benefit You And ROOF! Avoid the long waiting list, schedule your assessment today. Spring and Summer are great months to schedule your No Cost energy assessment! Newburyport, MA: Roof Over Head Collaborative (ROOF), a non-profit organization providing housing and services to local families in transition, recently welcomed its third family into the program and into a wonderful new home in Amesbury. This home, ROOF’s second purchased property, was possible in a large part from a generous donation from the Institution for Savings and the extreme generosity of many other individuals and organizations. Another organization that helped to bring this new home online in record time was JulieKing of Samarra Painting. Paint It Forward is Samarra's community outreach project, and through this program, they provided a color consultation and painting, including supplies, for a bedroom at no charge. ROOF welcomes donations of money, volunteer time, renovation skills and property to continue their works. To learn more about ROOF, please visit our website at www.RoofOverHead.org, email us at info@RoofOverHead.org. The mission of ROOF Over Head Collaborative is to provide transitional housing for families in need in Amesbury, Newburyport and Salisbury. ROOF collaborates with a support services partner to empower children and their families so their lives can be lived with dignity, ending the frightening reality of homelessness. Families pay a portion of the rent while maintaining an active status with the support services partner working to improve their education, job training, and other skills to help them to get up and out of crisis. To learn more about ROOF or to make a donation of time or money, please visit our webpage at RoofOverHead.org or info@RoofOverHead.org or 978-961-1555. About The Institution for Savings: the Institution for Savings is widely recognized as one of the oldest and most stable mutual banks in the country, with assets totaling approximately $1.3 billion as of March 31, 2012. It is also the largest mutual savings bank in the Greater Newburyport region and the third largest on the North Shore. Co-president Susanne Cameron represented ROOF at a community forum, "Three Approaches to Community Affordable Housing." Joining her were Ed Cameron, Newburyport City Councillor at Large, and the Associate Executive Director of the Division of Housing and Homeless Services of Community Teamwork, Inc., and Andrew DeFranza, Executive Director of Harborlight Community Partners, which provides housing with services primarily for low and moderate income people living in Southern Essex County. Susanne talked about ROOF's mission and target clients, stimulating lots of questions - including how to volunteer and support ROOF! Newburyport, MA: Roof Over Head Collaborative (ROOF), a non-profit organization providing housing and services for families in transition, today welcomed a generous donation from The Newburyport Bank. ROOF is currently fundraising to secure its fourth property to provide a local family with dependent children with a roof over their heads while they take part in a program to help them regain financial independence. “We have learned so much as an organization with our first properties and are pleased to see that our concept works and we are able to help these families in need,” said Kerri Perry, ROOF co-chairperson. 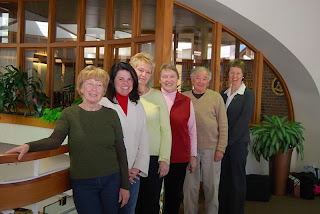 “With this gift from the Newburyport Five Cents Savings Bank, we have started fundraising for our next property and have a volunteer army in place to invest the “sweat equity” as well,” she continued. ROOF welcomes donations of money, volunteer time, renovation skills and property to continue their works. To learn more about ROOF, please visit our website at www.RoofOverHead.org, email us at info@RoofOverHead.org or call 978.961.1555. The mission of ROOF Over Head Collaborative is to provide transitional housing for families in need in Amesbury, Newburyport and Salisbury. ROOF collaborates with a support services partner to empower children and their families so their lives can be lived with dignity, ending the frightening reality of homelessness. Families pay a portion of the rent while maintaining an active status with the support services partner working to improve their education, job training, and other skills to help them to get up and out of crisis. To learn more about ROOF or to make a donation of time or money, please visit our webpage at RoofOverHead.org or info@RoofOverHead.org. Newburyport Five Cents Savings Bank is a growing community bank, with six locations and has over 90 dedicated employees. The bank provides its customers a full range of consumer, residential and commercial lending and business banking products and services. We also take great pride in supporting the many diverse social, educational, environmental, civic and cultural community based organizations to ensure that the greater Newburyport area is a vibrant place to live, work and grow. Giving back is the best way forward. The Reverend Christopher Ney of Newburyport’s Central Congregational Church gives a donation of $1000 to members of Roof Over Head Collaborative’s board members, Jo An Kincaid, Joyce Munier and Kerri Perry. The donation was one of several from the church to local charities as a part of their Outreach Tithe from their capital campaign. What a year for ROOF! Our dedicated Board came together to create and implement a program to house and support at-risk families in our community. Our site-selection committee searched and found two properties that ROOF purchased and one where we collaborated with a local landlord and leased. Our Fundraising Committee, led by Harvey and Norma Beit, inspired local businesses, institutions and members of our community who donated to our organization, allowing us to carry out our mission. After 2+ years of hard work and inspiration, in December, Harvey and Norma offered the Board their resignations. We will miss them dearly. Roof Over Head presented its first annual fundraising and awareness-raising event on Friday, October 21, 2011, at The Firehouse Center for the Arts in Newburyport. ROOF provided a night for the public to see the other side of our local candidates running for election in November. Candidates proved that their talents go far beyond policy-making in The Port Follies: A Politically Incorrect Variety Show. Local notables, John Macone, Editor of The Daily News, and Ann Ormand, President of the Greater Newburyport Chamber of Commerce, served as emcees, entertaining the audience and introducing the talent. Local musicians dazzled the audience with beautiful music. The Institution for Savings, Stoneridge Properties, Strem Chemical and iMarc all served as event sponsors. The Firehouse Center was the perfect stage for the event. The Firehouse staff opened their doors helping us bring our show to the stage. Hailey Klein, our uber-talented executive producer brought the show to life and kept it on track. The multi-media evening proved to be an uproarious and heartwarming good time with plenty of surprises. 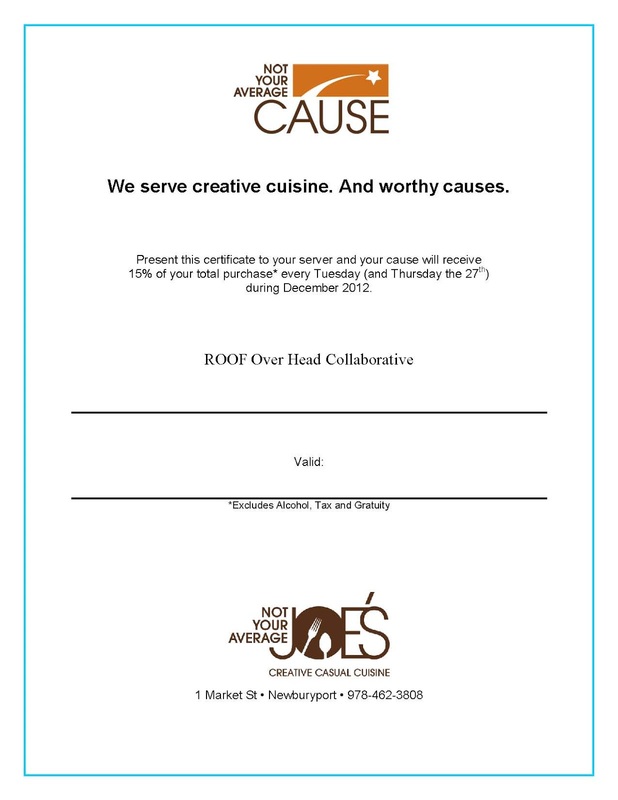 We were able to deliver our message and raise funds for ROOF as well! On Wednesday of Thanksgiving week, ROOF finalized purchase of its second home located in Amesbury, Massachusetts. The two bedroom condominium is located in a well-kept, well-run condominium complex. Our site selection team spent weeks inspecting the premises and meeting with the homeowners and determined it was a great fit for our organization. We were able to purchase this home with the help of compassionate funders and supporters. The home is being painted, cleaned and readied for our third ROOF family. Our year ended with Christin Walth joining our team. She will assist our Board in managing grants, programs, deadlines and the day-to-day functions of ROOF. Christin, who hails from Newburyport, brings an enormous amount of talent, expertise and energy. We are looking forward to beginning the New Year with a new focus and a continued determination to carry out our mission. In the last quarter of 2011, ROOF was the recipient of very generous grants: The Institution for Savings, The Provident Bank, The Newburyport Five Cents Savings Bank, Massachusetts Association of Realtors, Pennies for Poverty, The Forest Foundation, Central Congregational Church, The Swasey Foundation and Newburyport Area Industrial Development Foundation (NAID) all provided ROOF with funds allowing our organization to continue to provide transitional, supportive housing to at-risk members of our community. We sincerely thank them for supporting our mission. In 2012 we look forward to working with our Board, supporters, volunteers and partners. Thank you all who have followed our progress. We promise to stay true to our mission and continue to support the most vulnerable families in our community. The properties we transformed and the lives we impacted in 2011 will be a part of ROOF’s history.